Our very own Miranda Ballin (ArtWorks Artistic Director) has been selected for this once in a lifetime opportuinity to become a Fellow through the Clore Leadership programme. We couldn’t be more proud of her. The Clore Leadership Programme today demonstrated its commitment to promoting diversity in leadership when it announced the names of the exceptional individuals from across the UK who have been awarded Fellowships on the programme for 2014/15; an association with the BBC to support its new senior leadership development programme for people from Black, Asian and minority ethnic backgrounds; and the availability of bursaries on this autumn’s Short Courses for independent artists and those with caring responsibilities. The 2014/15 Fellows begin their individually tailored programmes of personal and professional development in September 2014. With mentoring support from a senior cultural leader, a professional coach and the Clore team, and a secondment in the UK, each Fellow undergoes a period of intense learning adapted to their aspirations, needs and circumstances. This year’s cohort is entrepreneurial, resilient and collaborative. They come from very varied professional backgrounds: some work for major organisations such as the Barbican, English Heritage and the National Records of Scotland, others are committed to developing stronger, healthier communities through initiatives like Valley Kids in Wales, the Great North Run Culture and the Cornwall Museums Partnership. All share a belief in the value of culture and the difference it can make in today’s society. The Clore Leadership Programme is introducing two types of bursary for the Short Courses it is running this autumn: the Caring Support Fund and the Independent Artist/Practitioner Award. Up to 12 individuals will be awarded Short Course bursaries this autumn across these two schemes, almost 25% of participants. The bursaries have been introduced in response to a survey on leadership development needs, commissioned by the Clore Leadership Programme on behalf of the cultural sector in England, and undertaken by Trends Business Research. The survey identified cost and caring responsibilities as some of the most significant barriers to participation in leadership training. Lives in Rhondda Cynon Taff. Artistic Director of ArtWorks, Valley Kids, a community development charity operating in the South Wales Coalfields. Previously a theatre director, performer and youth arts development worker. Miranda has worked with a number of theatre companies including the TIE Company, Welsh National Opera and Red Ladder Theatre. Miranda is also the Chair of Zoom Cymru, they work with young people through digital media to develop skills for life, work and the future. 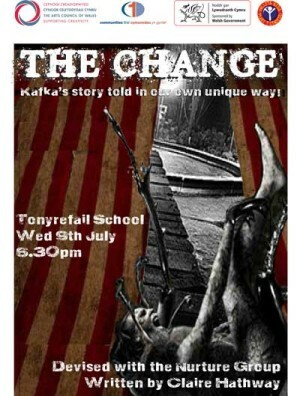 Following the success of their last production ‘Brothers’, Artworks are delighted to announce that as part of the Momentum Project funded by the Arts Council of Wales and Communities First, The Nurture Group will be performing their next stunning Production ‘The Change’ on Wednesday 9th July, 6.30pm at Tonyrefail school. In a small town, buried amongst the hills, a young boy named Phil wakes up one morning to discover he’s changed! Bewildered and terrified by his appearance, he fears his family won’t recognise him! Having discovered Phil, the family is horrified by what they see! His father, unable to recognise him and worried he might be vicious; forces him back into his room. Phil’s younger sister Eira protests that it’s Phil! She gives him hope that in time others will see it’s really him too! The Change is a dark, comical and emotive story that explores what it means to be to be truly human? Set against the backdrop of a seedy circus, with stunning physical theatre, it is a terrifyingly real story told in a beautifully imagined way. Kafka’s story told in our own unique way!